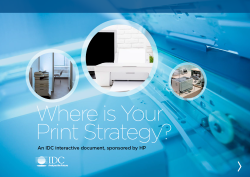 Where is Your Print Strategy? Help educate, inform, and motivate participation from all end users with clearly articulated goals and business rules by downloading this infographic. Organizations are constantly trying to increase the visibility and control of their print and document infrastructure and processes, but don’t know the most effective ways to do so. Print and electronic document workflows can reduce costs, increase productivity, increase security and compliance, and mitigate risk.